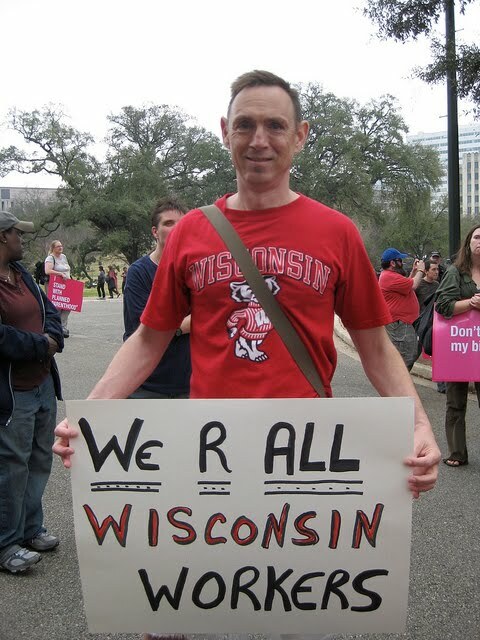 Hundreds of pro-choice demonstrators marched down Congress Ave. in Austin Saturday, Feb. 26 (above), and then joined with supporters of Wisconsin workers for an enthusiastic rally on the steps of the Texas state Capitol. 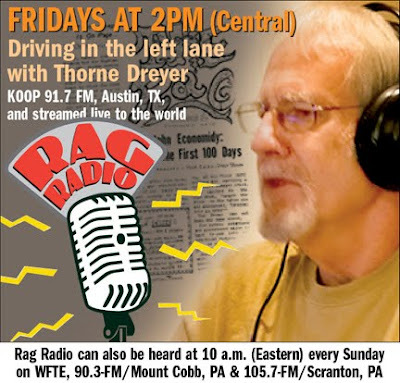 Photos by Terry DuBose / The Rag Blog. 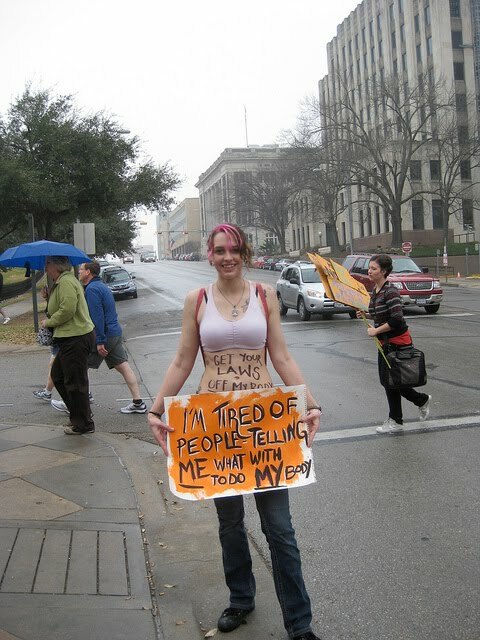 AUSTIN -- Two spirited demonstrations took place in front of Austin’s state Capitol on Saturday, February 26th. 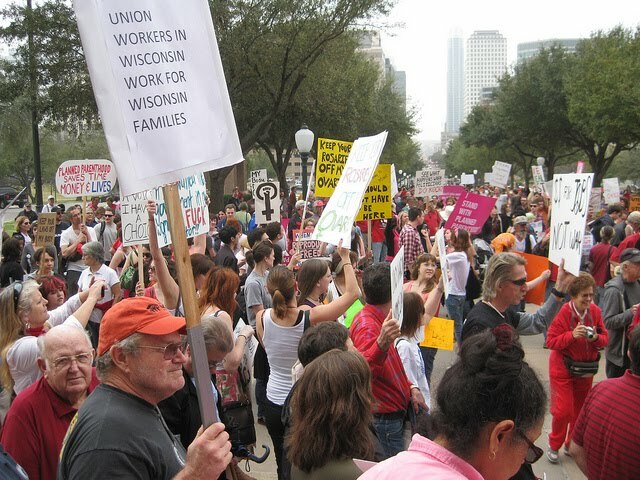 The Austin American-Statesman failed to cover the pro-choice rally and carried two paragraphs on the second Austin rally in a larger AP story on nationwide events supporting Wisconsin workers. Hundreds of demonstrators showed up at noon at the south steps of the Capitol to defend women’s reproductive rights and later marched down Congress Ave. 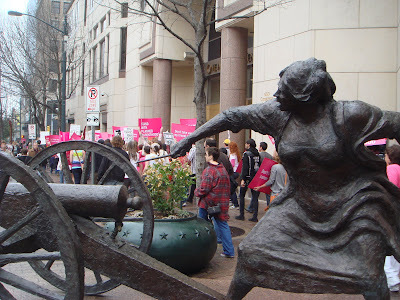 Speakers from Planned Parenthood, Whole Women’s Health, National Abortion Rights Action League (NARAL) Texas, the Lilith Fund and CodePink addressed the crowd. Pink was prominent and bright pink placards read: “I Stand with Planned Parenthood,” “Don’t take away my birth control,” “Don’t take away my breast exams.” Four of CodePink’s Pink Police led the march decked out with their crime prevention badges. Marchers split off from the south steps of the Capitol and went down the sidewalks on both the east and west side of Congress, trading sides at Sixth Street as the two lines returned. Passers-by honked and returned peace signs and fists. It was an impressive turnout, organized primarily with word spread through Facebook and listserves. In some ways, just as impressive was the decision by the pro-choice demonstrators to march up the sidewalk to the Capitol steps and join a 2 p.m. rally organized by MoveOn.org in support of Wisconsin workers. DPS troopers attempted to block the newcomers, but union advocates welcomed them. A crowd of about 1,000 listened to music led by Bill Oliver and friends. Texas Democratic Congressman Lloyd Doggett addressed the crowd, as did former Texas Agricultural Commissioner and populist pundit, Jim Hightower. Austin’s demonstration was one of many throughout the country and coincided with the largest turnout in Madison to date. More than 70,000 demonstrators gathered in Madison despite freezing temperatures. Hightower said: “You are the Koch brothers' worst nightmare.” The reference is to conservative donors Charles and David Koch who made huge contributions to conservative candidates in the last midterm elections and who, according to Reuters, "are playing an influential role in the drive to strip public employee unions of their rights to bargain in several U.S. states." Wisconsin’s newly elected Governor Walker returned the funding favors with over $100 million in tax breaks to corporations in January before he named teachers and public workers in his state as the cause of Wisconsin deficits. This was the second mobilization by Austin union supporters in one week. A demonstration organized by the AFL-CIO attracted hundreds to the south steps of the Capitol on Monday night. Austin’s teachers’ union, Education Austin, is calling for a large turnout at the AISD School Board meeting on Monday evening, February 28, where layoffs and school closures are on the agenda. It seems that the aggressive actions of conservatives who feel empowered by midterm elections are prompting nationwide mobilizations to defend rights ranging from the right to collective bargaining to family planning. On a related front, the Workers Defense Project is convening a march and rally to commemorate the 138 workers who lost their lives while working at Texas construction sites. The March 2 event, a “Day of the Fallen,” begins at 3:30 p.m. at the federal building and ends at the Capitol. Photo by Alice Embree / The Rag Blog. Photo by Terry DuBose / The Rag Blog. Photo by Terry DuBose /The Rag Blog.